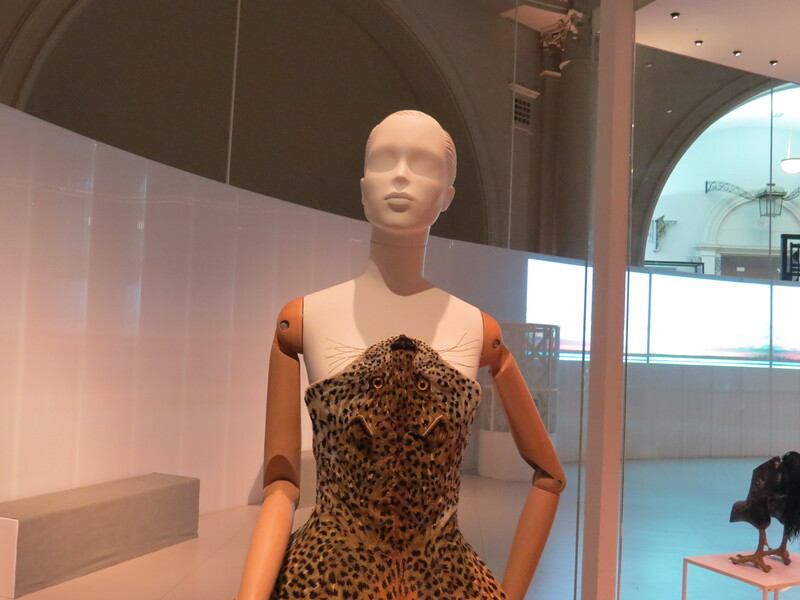 Dear Readers, on Friday I went with my friend A to a preview of ‘Fashioned From Nature’, an exhibition at the Victoria and Albert Museum which, as the title suggests, explores the relationship between fashion and the natural world. I was prepared to be upset, as the history of humans and the rest of the planet’s inhabitants hasn’t been (and still isn’t), an equitable one. Take the dress pictured above and below, for example. 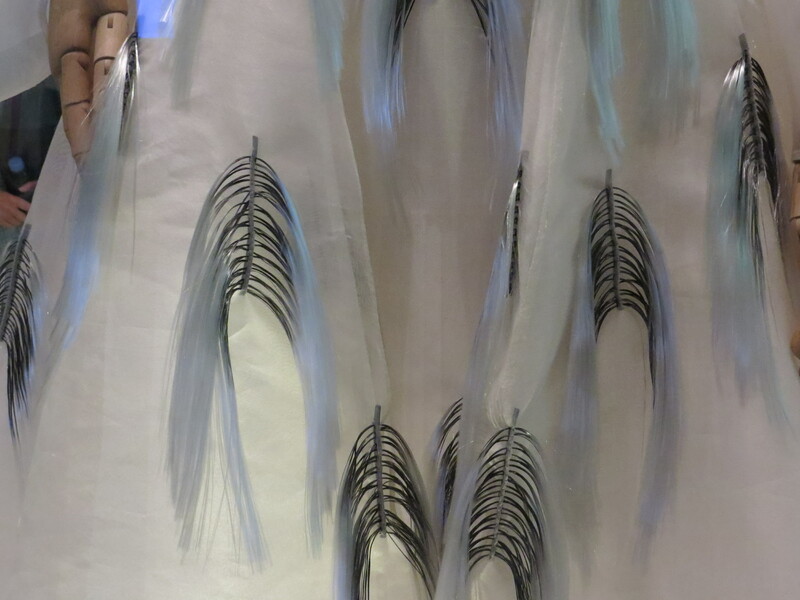 Each of the ‘beads’ is the wing case from a tropical beetle. 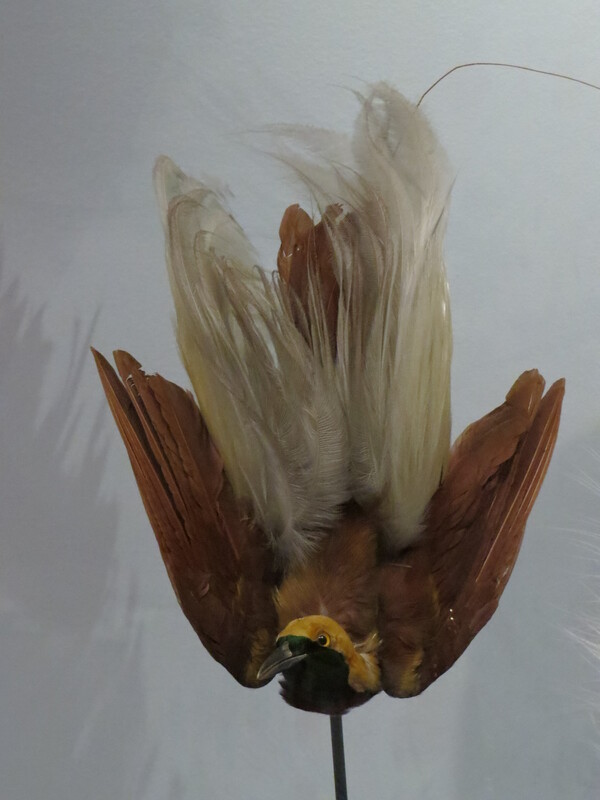 Or this muff, made from the breast feathers of a peacock. So much of our history has been about viewing the world as a cornucopia of treasures that we could plunder endlessly with no repercussions. All of the creatures of the world were available for us to use not just for food, but to convert into whatever trivial object we wanted, and there is nothing so frivolous as a party dress. And if this was all the exhibition was about it would be very depressing indeed. However, there are some beautiful things here that are inspired by nature but don’t involve violating it. 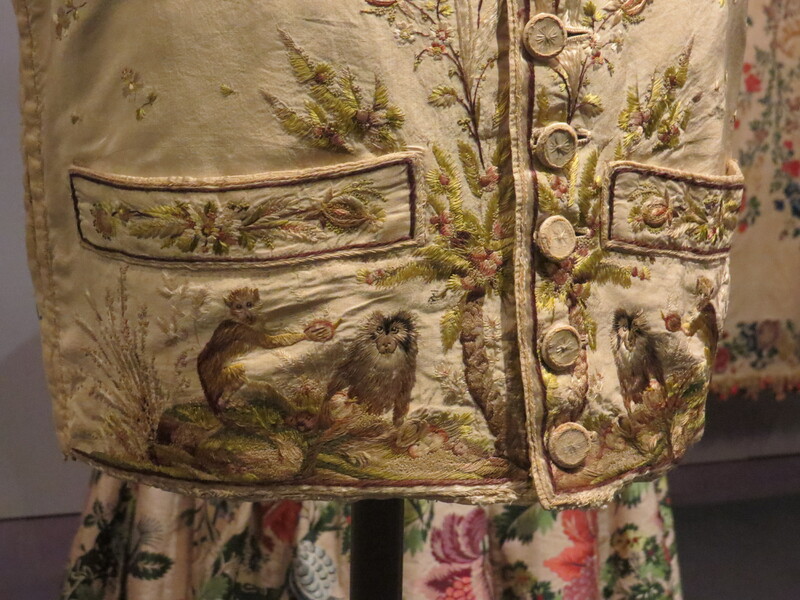 Take this waistcoat, for example, with its embroidered macaques. Or this wall hanging with its delightful caterpillar. 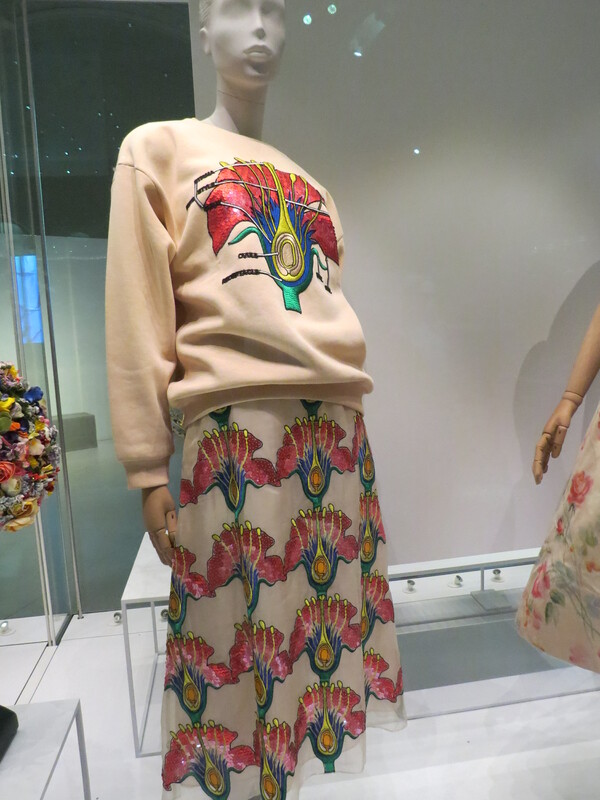 And I was particularly taken with this ensemble, with its embroidered representations of the sexual organs of a plant. It occurs to me how closely entangled art is with the plants and animals that surround us. The first cave paintings were of horses and mammoths, woolly rhino and camels. 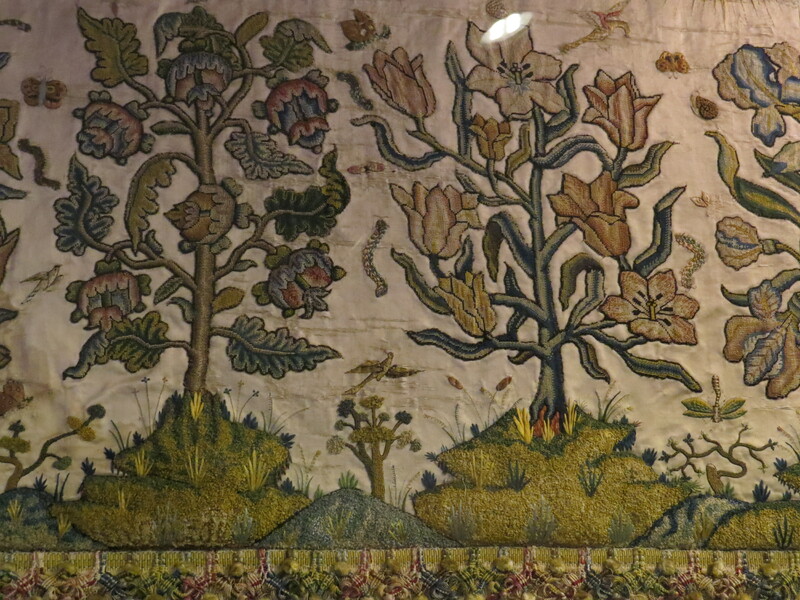 Once we started making fabrics we not only dyed them using plant dyes, but we represented plants in floral textiles. Just looking around as I sit at my laptop I see a bag with William Morris’s flowers all over it in one corner, a mug with a giraffe on it holding my pens and pencils, another bag made by my Mum featuring some patchwork cats, and a pair of discarded socks with fox terriers on them. Of course, I am probably more ‘nature-oriented’ than many people, but I bet most of us could look up right now and see a representation of a plant or animal within eye-shot. As we have become more ‘civilised’ we have on the one hand decided that we are separate from (and superior to) ‘nature’: at the same time we find ourselves yearning for our erstwhile companions, the plants and animals that we have lived alongside for most of our history. We fill our houses with plants and pets, and we cover our walls, our furnishings and our bodies with representations of them. How lonely we became when we decided that we had outgrown nature, and how foolhardy. 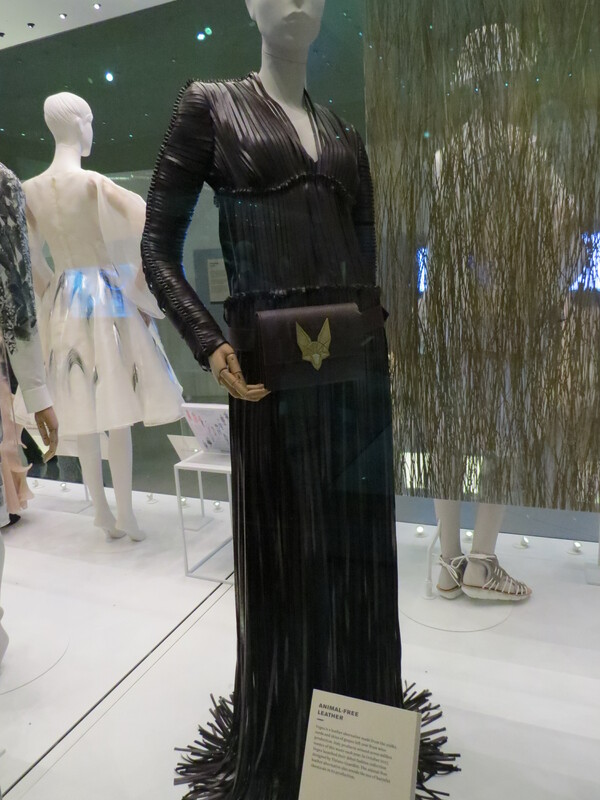 It is the third aspect of the exhibition that I found most inspiring because, as Stella MacCartney the designer recently said, the fashion industry is the most wasteful in the world. It encourages people to throw away their clothes every season, with side-effects for landfill, for the textile industries of developing nations, for workforces where labour laws are not as protective as they are in the West, and for pollution. However, there were plenty of examples of how that doesn’t have to be the case. The leather industry is one of the most polluting on the planet, operating alongside the meat industry – leather isn’t a by-product, it’s an actual reason for some animals to be farmed (and don’t get me started on python and alligator leather). 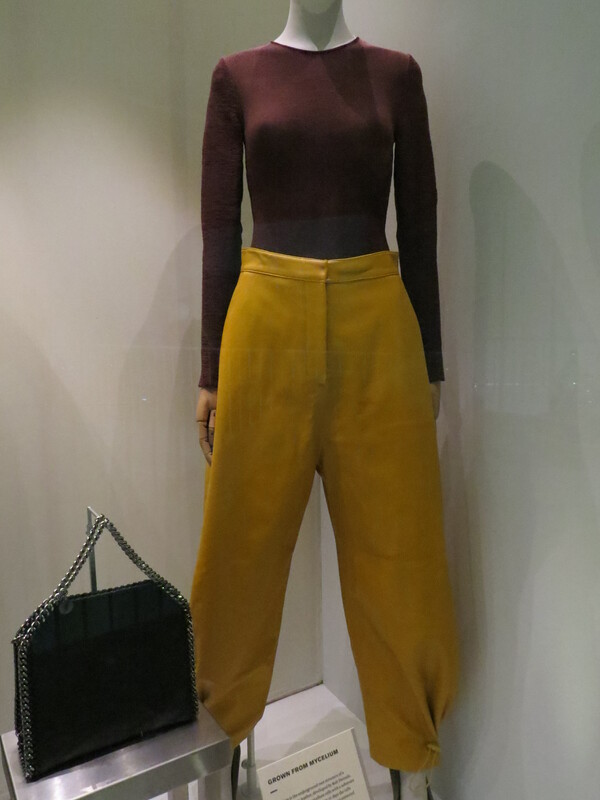 The trousers below were made from ‘leather’ made from mushrooms. 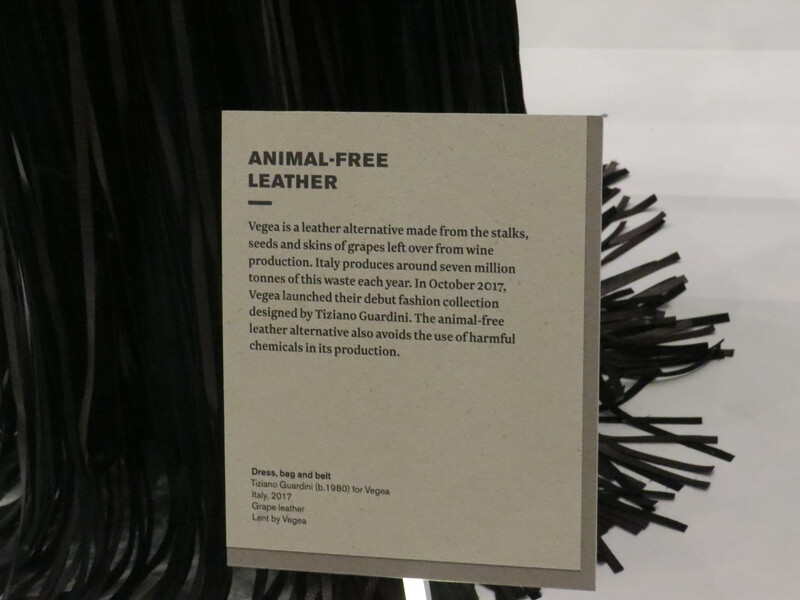 Trousers made from mushroom leatherThis dress is made from by-products of the wine industry. 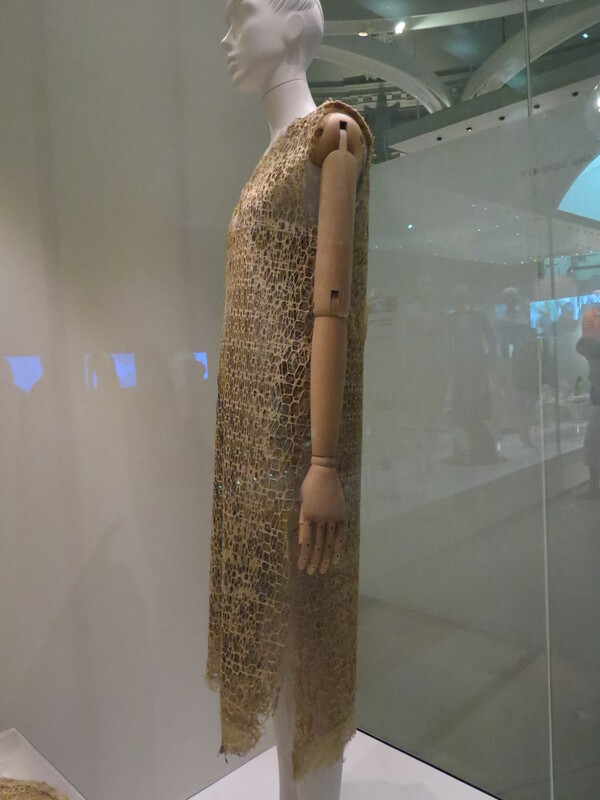 This silk dress is made from ‘Ahimsa’ silk – it is woven after the moth has emerged from the cocoon. 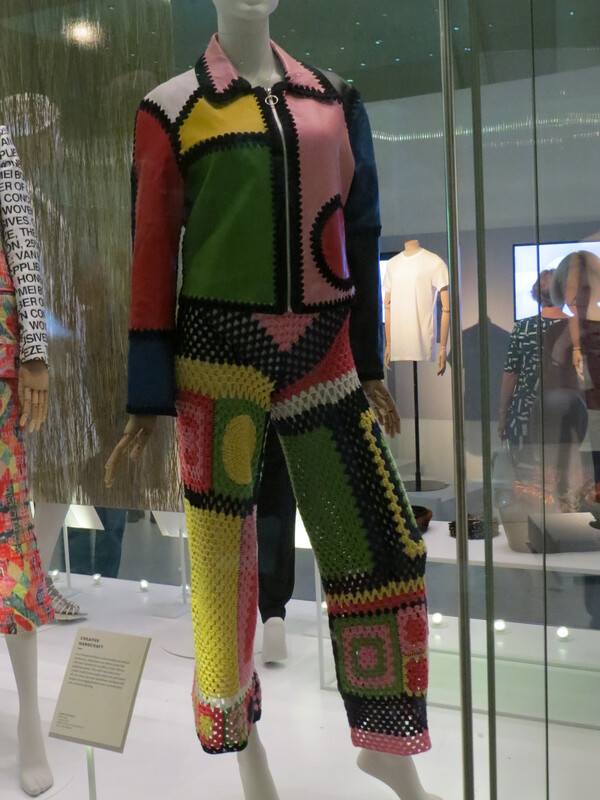 This ensemble was made from waste wool and scrap cloth. It’s a shame that it looks rather as if someone has run through a jumble sale, but I’m sure something rather more wearable by the average person could also be made. Plus, wouldn’t the trousers show the underwear? And be a bit draughty? And scratchy? There were lots of other examples too. The man who started the Burtons chain of men’s outfitters wore a Harris Tweed suit for over twenty years, on the basis that something classic never goes out of fashion. There’s a lot to be said for this approach – I’m trying to make my clothes last longer by buying items that can be accessorised in different ways as fashion changes. I have also noticed that if you keep things for long enough, they will come into fashion again. Someone told me that my dress was ‘on trend’ last week, much to my astonishment, so I’d say that the cycle is probably about ten years. 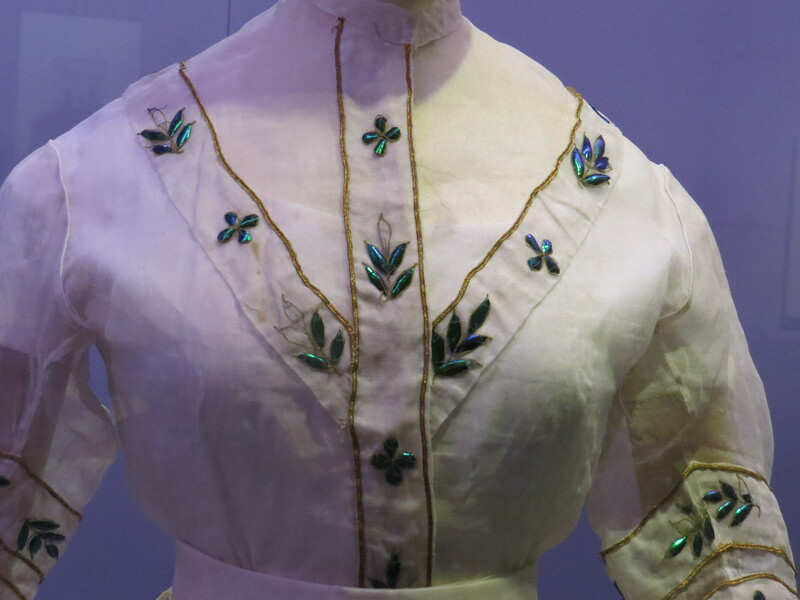 And I was rather taken by this dress, made by persuading plant roots to grow into a grid pattern. And just when I was settling down, I was suddenly outraged all over again. But wait. 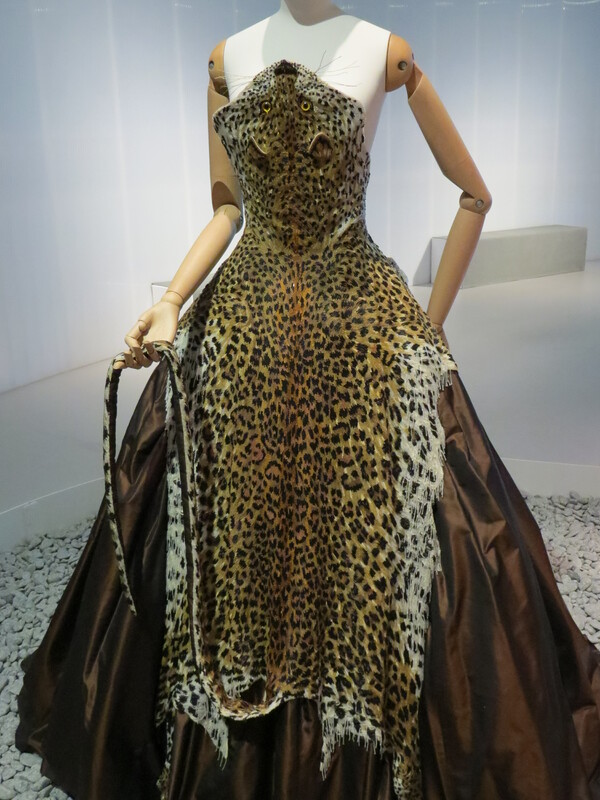 The whole of this ‘leopard-skin’ dress is made out of tiny glass beads. And so, everything is not what it seems. We have reached a point in our development as a species where we can have all the beauty of a leopard without hurting it, and we can have the suppleness of leather without polluting the planet. Which will it be, I wonder? Humans often remind me of Wily Coyote, just about to go over the edge of the cliff. It might be that we’ve gone over it already, and are peddling in mid-air, but maybe, just maybe, there’s enough creativity and will in the world to turn us back. Exhibitions like this make me question how the companies that I shop with are managing their ethical responsibilities to the environment and to their workforces, and make me think about the questions I should be asking of my preferred brands. If you are in London, I would definitely recommend a visit. 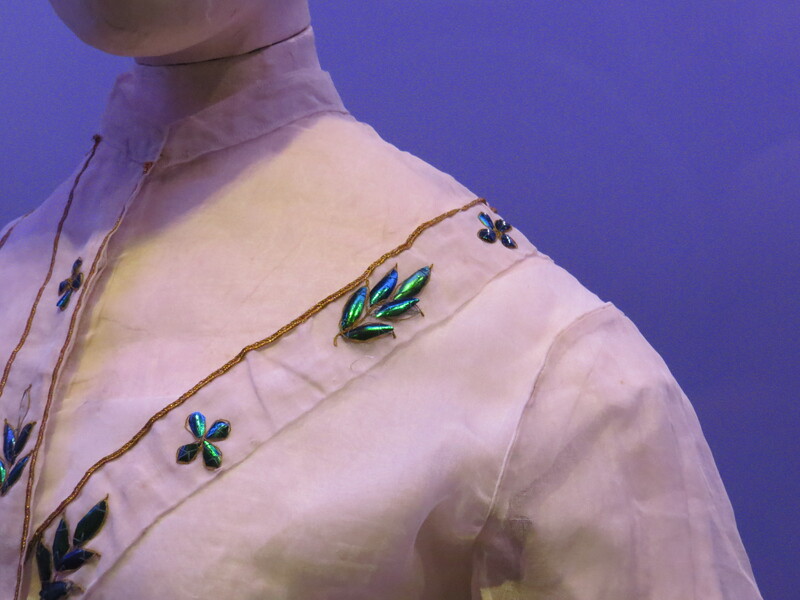 ‘Fashioned From Nature’ is at the Victoria and Albert Museum in South Kensington, London, until Sunday 27th January 2019. This entry was posted in Bugwoman on Location on April 28, 2018 by Bug Woman. A very interesting post, the embroidery on the waistcoat was beautiful, and who would have thought you could make trousers from mushrooms. In this day and age it is totally beyond us why anyone would want so called ‘fashion’ made at the horrific expense of living creatures. I couldn’t agree more, Fran and Bobby. I too can recommend this exhibition, especially the ‘upstairs’ section where there were lots of heartening surprises (as you describe). Good that photography was allowed: your pics are excellent. Thanks, Ann. Yes, upstairs was positively inspirational. A very interesting piece – thank you. You’re welcome, honeypotflowers, I’m glad you enjoyed it! This sounds fascinating. And you’re so right about us surrounding ourselves with images of animals, birds and flowers without thinking about why we might be doing it. Without moving from my laptop, I can see cats on the front of both my desk diary and my notebook, and a giant paperclip in the shape of yet another cat. The container which houses my pens is covered in butterflies, and my pencil case is decorated with violets. 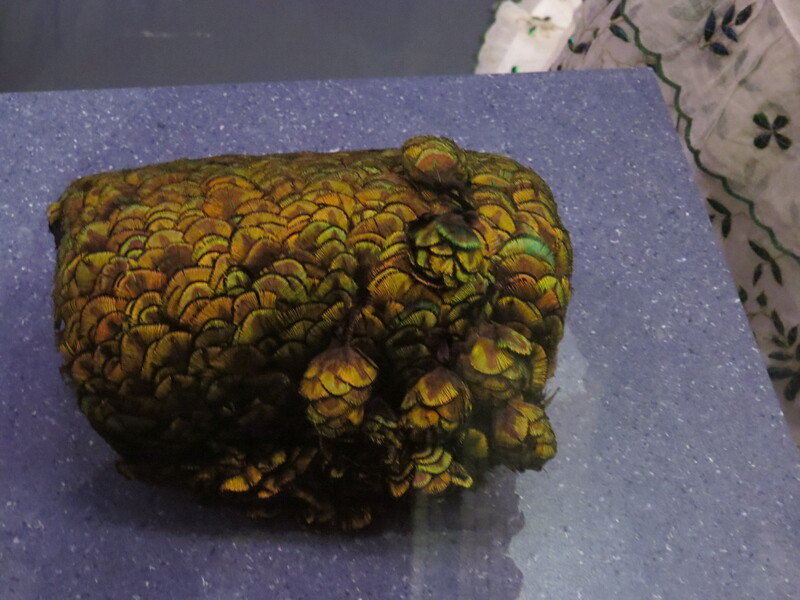 There’s also an egg cosy in the shape of a chick (I’m not sure what it’s doing there). Mushroom leather sounds exciting. Sometimes, when I cook them, they end up like that! Thank you for your description and photographs, I can understand your outrage. I am so far behind in blog reading, but I hope to catch up soon.